The midseason premiere of Grey’s Anatomy left all the characters’ dirty little secrets exposed, much to their chagrin. Most of the doctors have spent the season trying to avoid their problems, so it’s only natural that it is time for them to come to terms with their situations. “Help, I’m Alive” is a very character-centric episode that allows the viewers to take a deeper look at the characters’ lives. The first of the many storylines gives Meredith and Link a better understanding of each other. Meredith is in a pretty bad mood all day after Alex has to bail on helping her with little Bailey’s fifth birthday party. To make matters worse, Catherine is back at Grey Sloan and fires Meredith from her surgical team for spilling the beans about her tumor. As a result, Meredith takes out her anger on Link for the remainder of the episode. She criticizes Link’s every decision, from nonchalantly waiting for an incoming trauma to not stabilizing their patient’s pelvis before going to the OR. Meredith’s displeasure is twofold: she is using Link as a punching bag for her own anger management, and she is trying to convince herself that she doesn’t like him. Even though they don’t realize it yet, Meredith and Link do have a lot of similarities. They are only focused on their differences for the first half of the episode, which is made abundantly clear when they both separately ask Jo, within a matter of seconds, why she thought they would be perfect for each other. While Meredith, Link, Nico, Jo, Helm, and Parker operate on their patient, Jo decides that this is the perfect moment to cut the tension. She clearly wants Meredith and Link to work out their differences and get together, so she starts telling Meredith about Link’s past as a cancer survivor. Link is rightfully upset, as he feels that he should be the one to tell people his story. Funny enough, Meredith doesn’t immediately lighten up and instead decides to question his medical judgement. Link, who is tired of Meredith’s judgement, goes into full detail of why he made the calls that he did and reveals that doing anything differently could have cost the patient her life. He goes on to say that he doesn’t need approval on his medical practice from Meredith, who is taken aback by his response and the fact that she didn’t catch what he did. After the surgery, Meredith freaks out about having a house full of 5-year-olds for a superhero-themed birthday party and isn’t happy that one of the superheroes that was set to make an appearance had to cancel on her. Link offers his help after overhearing Meredith’s phone call. Meredith welcomes the help, and the two of them go back to her house to start setting up the party. Link’s knowledge of superheroes and willingness to stop everything to help makes Meredith realize that he’s not the person she thought he was. This is especially apparent when Bailey and his friends arrive to the party in full superhero costumes and ask Link if he is Thor. Of course, Link throws himself into the role and plays with the kids. As the party winds down, Meredith gives herself a rare five minute break to sit down at the kitchen table to have a drink and piece of cake with Link. I love the conversation that the two have because it is the most honest and open they have been with each other. Link finally understands why Meredith can be uptight and stressed. He truly respects the fact that she is a single mother of three, works crazy hours as a surgeon, runs her own department, and still has time to win awards for medical innovations. Meredith comes to understand Link’s laid back attitude more as the day goes on and learns more about his background. She admits that she doesn’t dislike Link, which is Meredith code for “I’m trying to suppress my growing feelings for you.” The two share an organic bonding moment, and it is clear how they could naturally become a great couple. Based on her actions in this episode, I can definitely see a future where Meredith actually opens up to Link and lets him into her life. She has always had a hard time being open, but he might be the man to change that. It was only a matter of time before Catherine, Richard, and Jackson would be together again and chaos would erupt. The events of the episode slowly build up the pressure in the powder keg before it explodes in a heated family argument. Unfortunately, they spend most of the day avoiding the topic of Catherine’s illness by working on a case together. Catherine thinks that she can perform a revolutionary surgery on a patient with the help of Richard and Jackson. Everything is smooth in the family until the surgery takes a turn, and Catherine can’t complete the procedure. After the surgery, the three of them convene in a room and things quickly get heated. Catherine accuses Jackson of questioning whether she was fit to do the surgery. Jackson and Richard get defensive and bring up the topic they have all been avoiding: they want to know why Catherine won’t talk to them and why they had to find out from someone other than her. Catherine is very upset that she didn’t tell them herself, but says she was waiting for the right time. This makes Richard and Jackson upset because they feel that she hasn’t been honest with her family. After some more shouting, Catherine finally breaks down and tells them that she didn’t want to talk about it because then it would be real. It’s easy to feel terrible for this family with all they have been going through lately. The third story of the episode deals with Owen, DeLuca, and Schmitt helping a woman with the flu. Owen, who has not been feeling well, decides to walk around the hospital and help patients while hooked up to an IV bag. This is definitely foreshadowing, as there is no way in which trying to be a doctor and a patient at the same time can end well. Owen and DeLuca realize that their patient’s colon is distended and take her up for surgery. While prepping for the surgery, the patient’s colon bursts, leaving her in great pain. Owen tells the anesthesiologist that they need to hurry up and start operating, so the anesthesiologist goes to give the patient a paralytic to stop the pain before putting her under. Only problem is that he mistakenly injects the paralytic into Owen’s IV instead of the patient. Well, Owen drops to the floor like a sack of potatoes within a few seconds, leaving DeLuca to have to operate on his own. DeLuca jumps into action and tells Schmitt that he will have to take care of Owen. Schmitt is very nervous, having to intubate Owen before his airway completely closes. DeLuca walks Schmitt through the procedure like a seasoned pro, and Schmitt is proud of his accomplishment of doing his first intubation. DeLuca continues on with the surgery, and Alex comes in to check on him a little while later. Alex asks DeLuca to tell him the steps he has taken so far, and DeLuca rattles off the correct list. Alex then asks what else he still has to do, which stumps DeLuca. He says he doesn’t know what else he should do and asks Alex to tell him what is next since this is his first solo surgery. Alex tells DeLuca that he has done everything right and that the only thing left to do is close up his patient. DeLuca stepped up at the right time and completed his first solo surgery with great success. This will definitely be a big confidence booster for DeLuca, but let’s hope this doesn’t go to his head. The episode ends with DeLuca sending a text to Meredith asking her if she wants to help him celebrate his first successful surgery, but she doesn’t see the message since she is enjoying her quality time with Link. A bunch of other characters have small side stories about taking steps forward in helping themselves. Bailey has finally started seeing a shrink and getting the therapy she desperately needs. We get to see that Bailey is making some progress, which is great news. She needs to continue helping herself before she has another breakdown. Richard also makes some strides by finding a new sponsor and taking advice from him. Richard is going to meetings more frequently and starts meditation and prayer again. With all that is going on with Catherine, Richard is going to need another support system, so it’s good to see him recognize that as well. Schmitt gets a much-needed boost of self-confidence through taking care of the unconscious Owen. Teddy walks by the hospital room where Schmitt is watching after Owen and wants to know what happened. As she is freaking out, Schmitt calmly explains what happened. Teddy thanks him for helping Owen and says that she is respectfully going to stay and watch over Owen until he wakes up too. Schmitt is overjoyed to hear that someone respects him as a doctor and decides that he will no longer go by Glasses. He finds Nico and pulls him into an on-call room for a quick make out session to display his newfound confidence. Schmitt continues his transformation by having Parker and Helm help him get contacts, that way he can give up his clunky glasses and be a new person. After Owen starts to recover from his rough day, he has a conversation with Teddy about whether she plans to stay in town. Teddy spent the day trying to get a job at Grey Sloan, but since Maggie is the head of cardiothoracic surgery and is Amelia’s sister, things haven’t been working out well. Teddy considers going back to Germany, but Owen doesn’t want her to leave. He decides to give Teddy his job as head of trauma and work for her to keep her and his unborn baby in Seattle. 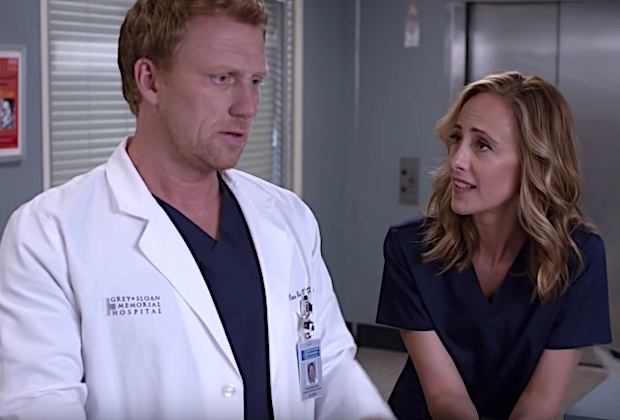 Owen is right in saying that he needs help in trauma because the hospital hasn’t hired someone to fill April’s position. Plus, with what the two of them accomplished in the elevator in the midseason premiere, they will make a great trauma team. With Teddy definitely sticking around, we will have another fun romantic situation to watch play out. Owen wants to be with Amelia and have Teddy and his baby around, so I don’t know how he’s going to balance two lives. Amelia spends the day working with Tom Koracick to hopefully find a way to operate on Catherine’s tumor. Tom is interested in Teddy and decides to introduce himself to her at the end of the episode. It would be really interesting if Teddy and Tom become a thing because seeing Amelia and Owen’s reaction would be priceless. Plus, a love square might be kind of fun.